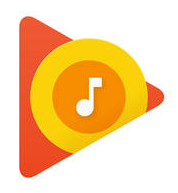 Google have a music syncing solution called Google play. You need the “Google play” app for your iOS device and there is a “music manager” app that runs on your computer. Step 1: Download the Google play music manager onto your computer. Go to http://play.google.com and sign in to Google Play using your Google account. 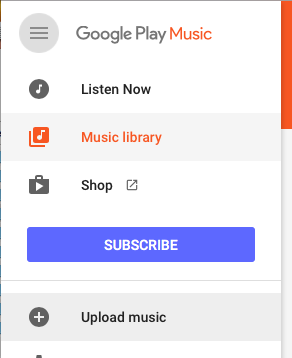 Go to the menu on the left of Google play and select “Upload music”. Selecting upload music does not upload your music! Instead, it will take you to a screen where you can download the music manager application to your desktop OS X computer. From there, you will be able to upload your music from your iTunes folder. Click on ‘Upload music’ to upload your songs from iTunes to gain access to the Google music manager application. Before you upload your music it’s a good time to get organised! Google music manager is going to copy all your Apple iTunes songs to the Google cloud and then across to all your other devices. It’s worth doing a bit of a clean up before this happens. Move any large files that you don’t want out of your iTunes folder. Google Music Manager is intelligent. It matches your songs and does not upload songs that are already in the Google cloud. For example if you have Abba ‘ Fernando’ Google will recognise this song and put Abba ‘Fernando’ onto your Google playlist, but it won’t need to upload the song from your computer because it already has the song. 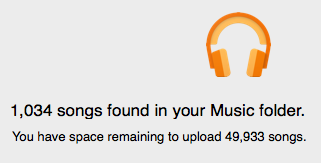 This means if you have things in your iTunes folder that Google won’t recognise (for example I have lots of talks that I have recorded) it will take a lot of your bandwidth to upload them all. I moved a stack of old talks all out of my iTunes folder and put them in a different folder on my computer so that Google Music Manager did not copy them. Another thing you might like to do is use the menu item ‘File: Library: Show duplicate items’ in iTunes to delete any duplicate files that you have. Step 3: Upload all your music to the cloud. This is a bit like the old iTunes music subscription service where it uploads your songs to the cloud. Run Google Music Manager and follow the instructions. When I selected “iTunes” it did not work for me. It tried to put the Google play songs into my iTunes music folder but it did not recognise my iTunes songs. If you select “Music folder” it will put all your songs in your main music folder. 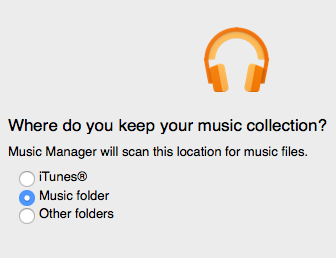 Music manager found my iTunes songs automatically. 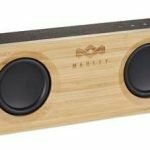 Music manager skimmed through my songs and uploaded them very quickly, it must have found lots of matches because it hardly used any bandwidth and didn’t take long to “upload” of the songs. It is obvious that it was not uploading them but rather ‘syncing’ them to an online version of the song that Google already has. 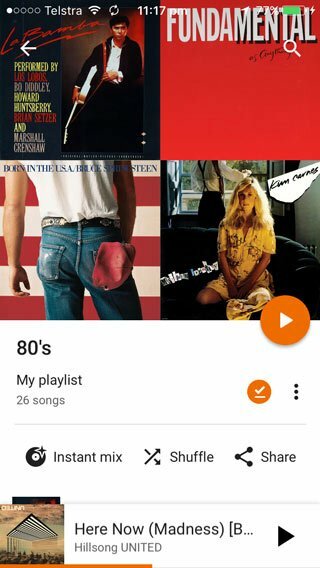 Google music manager will automatically add any future iTunes purchases or any songs I drag into the music folder to my Google music account. 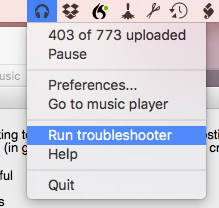 If you come across any problems go to the music manager icon in the menu bar and select “Run troubleshooter”. This will let you know if music manager is having any errors and what they are. Step 4: Download the Google play app onto your iOS devices. Download the Google play app from the Apple App store onto your iPhone and iOS devices. See this article for more info about the Google Play App. All your music will be there. Enjoy! Step 5: Download the Google play app onto your iOS devices. 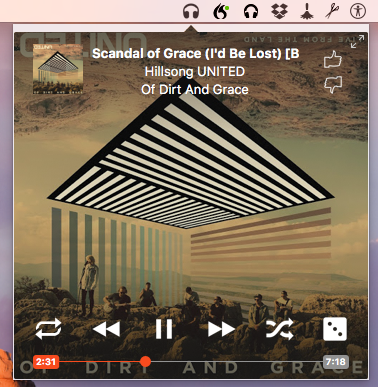 This open source third-party app called ‘Radiant’ will allow you to play your Google play songs on OS X. The radiant player appears in your menubar and allows you to play songs from Google play. Google play music app How to find cover art for itunes How to get the Best Free OS X software How to convert an iTunes song to MP3 How to sync and share your iTunes music across multiple mac computers and iPhones. i love both the google player ad iTunes. Now, i am using setbeat app to download free music on Android and iPhone. I can’t seem to log in to Music Manager.